Billed as the largest light sculpture in the world, The Bay Lights officially illuminated over the San Francisco Bay two weeks ago, bringing a bright new addition to the city’s skyline. The massive 1.8-mile long, 500-feet high art display includes an impressive 25,000 LED lights and 100,000 feet of cable. Set to run every night from dusk to 2 a.m. for the next two years, Illuminate the Arts intends for the sculpture to become a brilliant cultural beacon of San Francisco. “By creating a piece of contemporary, epic public art on a piece of infrastructure of the magnitude and importance of the Bay Bridge, we are demonstrating to any one who sees it in person or via social, online or other media that the impossible really is possible and that art matters,” Amy Critchett, executive director of Illuminate the Arts and executive producer of The Bay Lights, said. According to their mission statement, Illuminate the Arts is a nonprofit organization dedicated to the creation and presentation of community-activating public art, by providing innovative art programs that inspire involvement and collaboration. Illuminate the Arts is not new to the world of big and bold art. While working on The Bay Lights project, they also completed the “Pi in the Sky” art installation late in 2012, in which five skywriting planes drew the first 1,000 digits of pi’s infinite sequence in the skies above the San Francisco Bay Area. Inspired by its 75th anniversary, Illuminate the Arts chairman Ben Davis wanted to successfully commemorate the hardworking and often under-looked Bay Bridge with a similar large-scale art piece. Though the Bay Bridge carries more than 250,000 cars a day, it is often overshadowed by its brilliantly painted sibling, the Golden Gate. According to Critchett, Davis was inspired by artist Leo Villareal after discovering his exhibit at the San Jose Museum of Art in 2010 and contacted him to work on The Bay Lights project. “Villareal was immediately intrigued by the magnitude of the Bay Bridge and the endless possibilities for a fine art piece that millions could enjoy,” Critchett said. Internationally-acclaimed light artist Villareal viewed the Bay Bridge as his canvas, synthesizing patterns from elements of the San Francisco Bay environment (including traffic, waves and wind) to complete his vision. 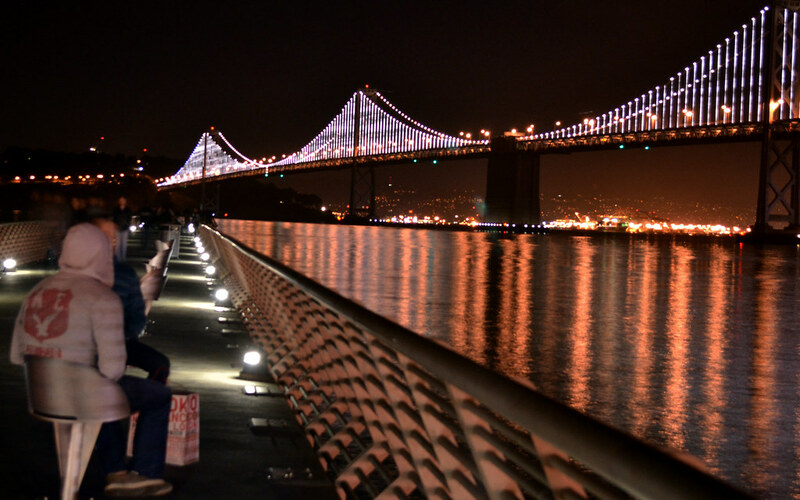 Villareal programmed each of the 25,000 lights individually to create a non-repetitive brilliant display across the west span of the Bay Bridge until March 2015. The project began in August 2012 when Illuminate the Arts was awarded permits to install from Caltrans. For six months, starting in September 2012, a crew of eight-to-10 electricians from Bleyco Inc. worked five days a week from 8 p.m. to 5 a.m. to install the sculpture. The $8 million project is 100 percent privately funded and uses energy efficient techniques to illuminate the LEDs for about $4.25 per hour, totaling to around $11,000 in energy costs each year. The installation is powered completely by off-site solar generated at the CleanPath-owned PVUSA shared solar farm in Davis, Calif. Eight times the scale of the Eiffel Tower’s 100th anniversary lighting, Illuminate the Arts expects the Bay Lights to impact well over 50 million people and bring in at least $97 million to the local economy in tourism dollars. “Since this 25,000-LED light on the SF-Oakland Bridge is one-of-a-kind, it will attract more visitors from around the world, from within the country, and even from outside SFO city. People will frequent to the local restaurants to get a glimpse of those lights. Thus, economy will get a boost through tourism, through more visitors to the local areas malls and restaurants,” economics department chair Sudip Chattopadhyay said. Lane isn’t alone, as early public response to the project has been enthusiastic and locals have already begun to get attached to the lights. The Internet and social media have been buzzing with various photos and statuses about the new addition. “The Bay Lights has garnered an incredible outpouring of generosity and support. San Francisco is a very special community that really embraced this idea,” Villareal said. Similar to a “Buy a Star” program, there is a “Gift of Light” program to support the project in which you can commemorate a friend or relative or celebrate a special occasion by purchasing a light or series of lights. Still $2 million short in finishing funds, Illuminate the Arts urges people to support the project in any way they can.